Bulk SMS software for GSM mobile is useful mobile marketing solution to send thousands of text messages instantly from your GSM mobile connected with PC. GSM mobile messaging program successfully delivers notifications as well as standard messages over worldwide location within minimal time. 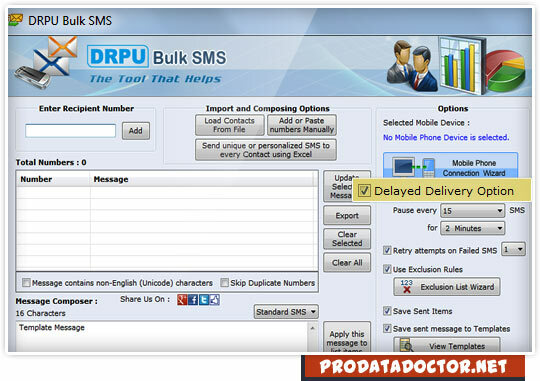 Bulk SMS sender software sends unlimited text messages from to single or group of mobile users using GSM mobile phone. SMS gateway program provides option to import phone number directly from PC while sending bulk SMS over global mobile network. SMS broadcasting programs saves your sent text messages details to txt or html file formats for future reference. Mobile marketing solution provides facility to skip duplicate contact number entries during group text messages sending procedure. GSM mobile messaging software successfully sends unlimited text messages over global mobile network without needing internet connection. Sends unlimited text messages simultaneously over global mobile network. Forwards group text messages to numbers of mobile users without requiring internet connection. Provides exclusion list wizard facility to maintain list of contact number while sending group text messages from GSM mobile. Offers delay delivery option to control or customized load of bulk SMS across the world. Send thousands of text messages in different languages. Saves sent group text SMS details to templates which can be easily viewed by user whenever requires.